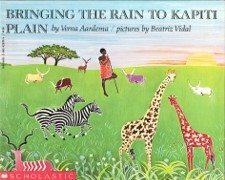 This book tells the story of how a young boy, Ki-pat, brings the much needed rain to the dry Kapiti Plain. Interested in using this resource in your classroom? Check out the posters that go along with this book: Economic Wants, Natural Resources, Capital Resources, Scarcity. Ki-pat was a herdsman. On the Kapiti Plain, what does a herdsman produce? Cattle, which provide food, milk, leather, etc. Identify the severe scarcity problem facing the herdsman of the Kapiti Plain. There was not enough grass for the animal herds. The animals grew hungry, dry, and lean. What scarce natural resource did Ki-pat need in order to have enough green grass to feed his herds so that they could become healthy and fat? What is it called when a region has such a severe scarcity of rain that it affects the land and all who depend on the land? List other animals (natural resources) besides the cows that were affected by this scarcity of grass. Explain how Ki-pat solved the severe scarcity of grass caused by the drought. Ki-pat shot an arrow (capital resource) with an eagle feather into the dark clouds to pierce them and loosen the rain so that it would fall down on Kapiti Plain. This watered the grass, making it green for his herd and all the other creatures. Is this really how people get rain to fall? No, this is a folktale. Shooting an arrow in the sky can't cause it to rain. Explain what would have eventually happened to all the creatures, including humans, on Kapiti Plain if the scarcity of grass had continued? (Answers will vary) The people and animals would have to move to another area with green grass or they would all die. In more developed countries, what do people do to make sure there is water in time of drought? Do these methods always work? No. Sometimes the drought is so severe that the canals, reservoirs, and rivers run low or dry up. Sometimes there is not enough water from wells to irrigate the fields.